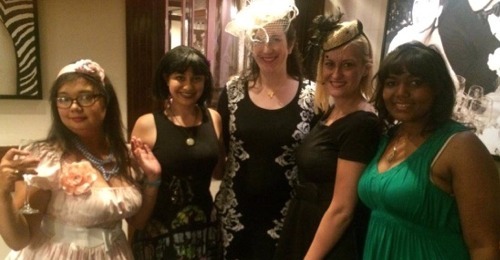 At the very last minute, I was invited to tea time at Steakhouse 55. My colleague, Rachael (Tomo Neko), had sent me an invite the day before. 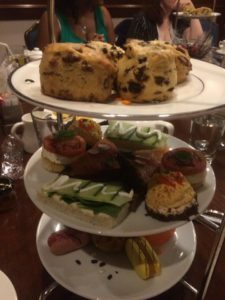 I’ve had afternoon tea at Steakhouse 55 a few months prior. 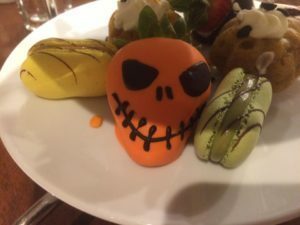 To ring in the October holidays, Steakhouse 55 was doing a month long Halloween themed afternoon tea time event. The event sold out quickly. When it was announced back in August, everyone I knew was all over it. Getting a reservation was just like getting tickets to Hamilton. However, I was lucky to replace a last minute drop out. 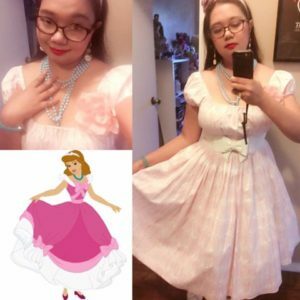 I ended up wearing my Cinderella bound based on the pink dress her animal compatriots made. I’ve always liked this dress and how it was made during the first part of the movie. It makes its demise rather tragic. 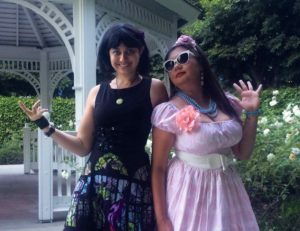 As a seamstress, I liked all the details and thought put into animating the sequence – particularly making a full on ballgown at the last minute (and gathering remnants to make something pretty). The dress is by Bernie Dexter from Unique Vintage. The belt is also from Unique Vintage. The headband is from Pipstar Pop. The beads were just a few things I had in my stock. 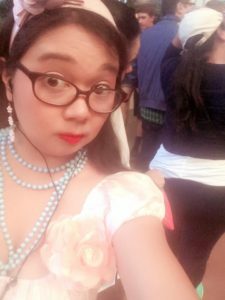 The shoes are from Bodyline. I ordered the premium tea set. It was around about $65. This also included a glass of champagne and take home truffles. We had a huge party of 20 so we were seated in the private room in the back. The tea treats menu was just about the same as the regular menu, but there were some spooky twists to them. For my choice of tea, I started out with the rosy fig and finished with the white chamomile. I also sampled Rachael’s red velvet and it was sweet, yet decadent. I normally go for herbal comfort teas like the rosy fig. However, the nice thing about Steakhouse 55 is that you can sample and change up your tea throughout your stay. 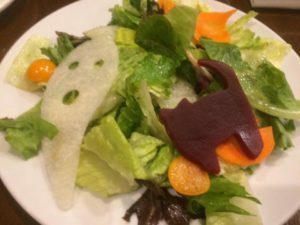 You might miss it before you dig in, but there’s a spooky ghost and a cranberry cat in the salad. Also, the best grape tomatoes you’ll ever have. Premium tea comes in three plates. This is considered tea for two; I shared it with the dapper gent next to me. First tier were the scones. Second tier were the savory treats – my personal favorite of the set. The last plate was the desserts. By the time I got the dessert plate, I was already full. 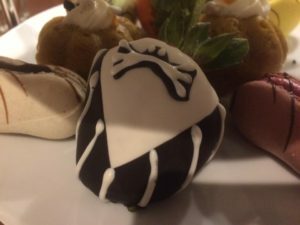 For the chocolate covered strawberries, they were done up to resemble Jack Skellington from Nightmare Before Christmas. I had to take a bite out of Jack. Sorry (not sorry). 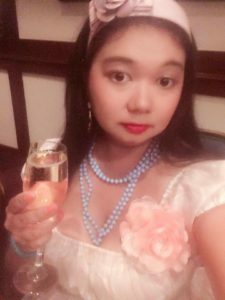 The champagne was nice and fizzy. It was bubbling for a while! And a visit to the (main) park! I figured since I was in the area, I’d visit the park. 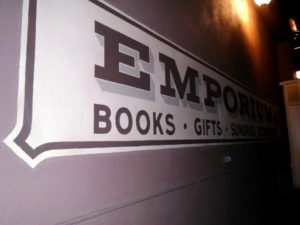 I normally don’t go on a Saturday because it’s too crowded for my taste, but I decided to go anyway. 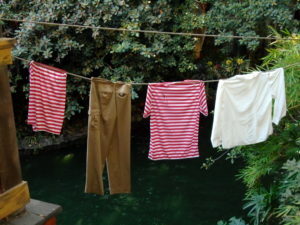 I ended up stopping by the Jungle Cruise. However, it was a 30-ish minute wait. It was a blessing in disguise though. 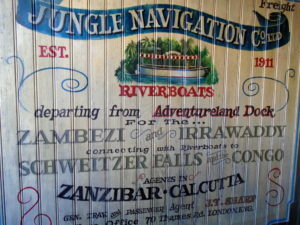 I usually wait no less than 10 minutes for the Jungle Cruise, so I don’t get to see the entire queue. 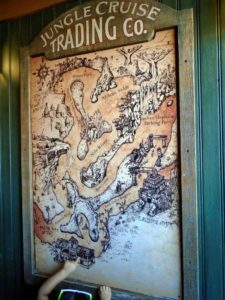 I liked that I got to see the entire queue for all it’s time period details and little things that really make it like an early 20th century jungle expedition. There’s a lot of interesting finds here if you look closely. My face when there’s a line for Space Mountain fast passes. 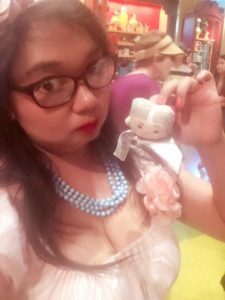 That awkward moment when you find a tsum tsum of your step mother. 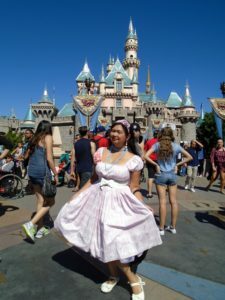 Obligatory Sleeping Beauty castle photo. Stupid sun. Upon exiting, there was a huge crowd for the nighttime Soundsational parade. Guests were brought to an alternative route. 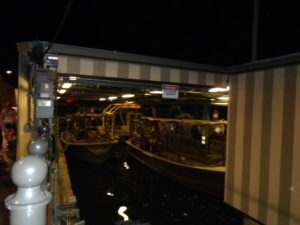 The most spiffy thing was seeing some of the unused Jungle Cruise boats parked. While we did run into some typical problems when you have a large group (20 here!) 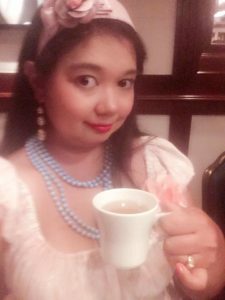 having afternoon tea, I really thought it was nice way to spend my free Saturday afternoon. 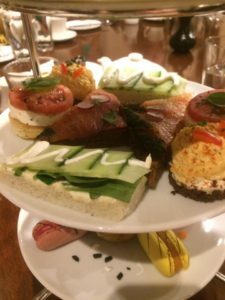 While it is one of the more pricier afternoon tea’s I’ve had, it’s a nice and cozy environment – great for catching up or meeting new friends. 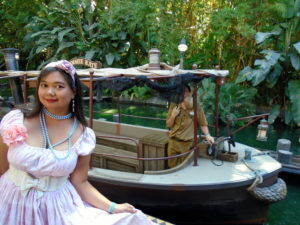 As far as the Halloween theming, the only real Halloween theme was the candies and ambient music. The ambient music reminded me of the harpsicord opening to Lady Gaga’s “Bad Romance,” not that it’s a bad thing, but that’s the first thing it reminded me of. 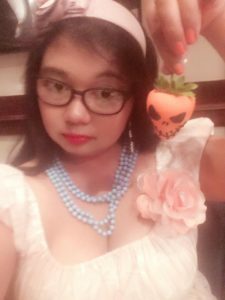 Granted this is the first time Disneyland is doing a Halloween themed tea party, I’m hoping for more Halloween theming and treating for next time around. Definitely bring this back! Many thanks to Rachael of Tomo Neko for the additional photos.